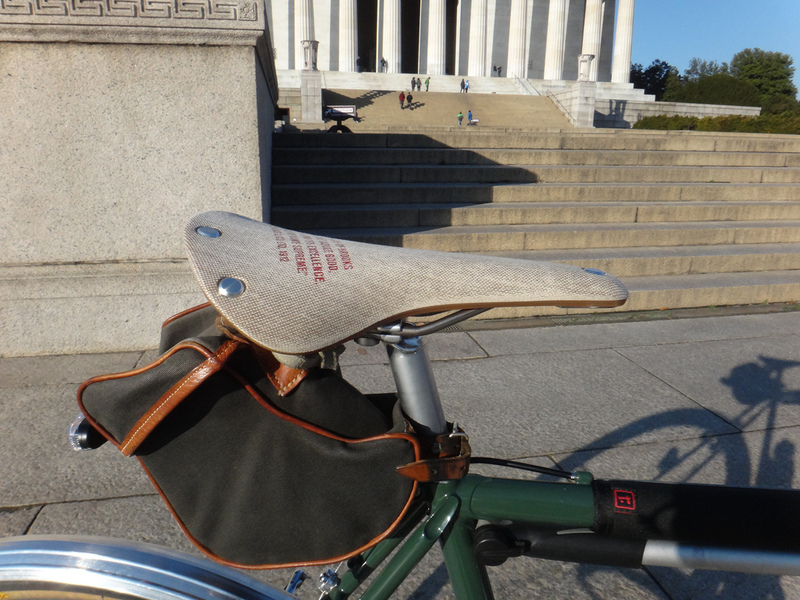 The new Brooks non-leather saddle, the Cambium C17, caught my eye recently during a stop at one of my favorite local bike shops, BicycleSpace in downtown Washington. The off-white woven fabric cover and rubber base was certainly different than the traditional Brooks saddles MG and I use on most of our bikes. The British company is synonymous with leather and has been on a roll in recent years with the growth in urban and non-competitive cycling. Test model had promotion text by Brooks. I’m among those who were skeptical when they announced the Cambium line that it would be more than just another uncomfortable racer saddle. Handling the display model, the quality was higher than I expected. I offhandedly asked if they had a loaner and I was offered a C17 to use for a week. In a few minutes I installed it on my Rivendell SimpleOne singlespeed bike and off we went. Quick verdict: The C17 is surprisingly comfortable! Brooks managed to get the feel of their mainstay B17 leather model into this saddle, while offering features that should appeal to riders who might not ride leather. The price is a little steep, however. Would I buy one? Read on. 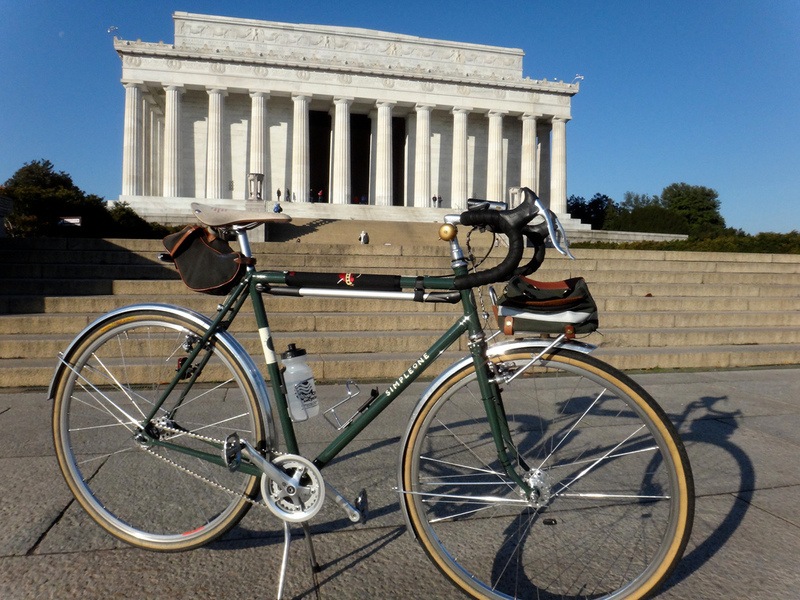 Cambium atop my Rivendell SimpleOne at the Lincoln Memorial. Looks: Let’s address appearance and construction first. I’ve gotten a few questions about what Brooks calls the “organic cotton canvas” cover. It looks coarse but is mostly smooth to the touch and there is nothing noticeable about it when riding. They’ve put a waterproof coating on it, so rain and sweat are not supposed to be an issue. In any case the cover is bonded to a slightly flexible natural rubber underlayer that can’t be hurt by water, so I’d consider this an all-weather saddle. Brooks includes their signature rivets at the rear and on the nose, and builds in bag loops into the rear frame which I confirmed allow the attachment of a Carradice saddlebag — a nice touch. Form: Along the top the shape is similar to the leather B17, with a long flat nose and raised rear heel when the nose is level. The widest portion is about 160mm, which is narrower than the 170mm B17 (and equivalent to the Brooks Professional) but the Cambium did not feel much narrower than a B17 when riding. 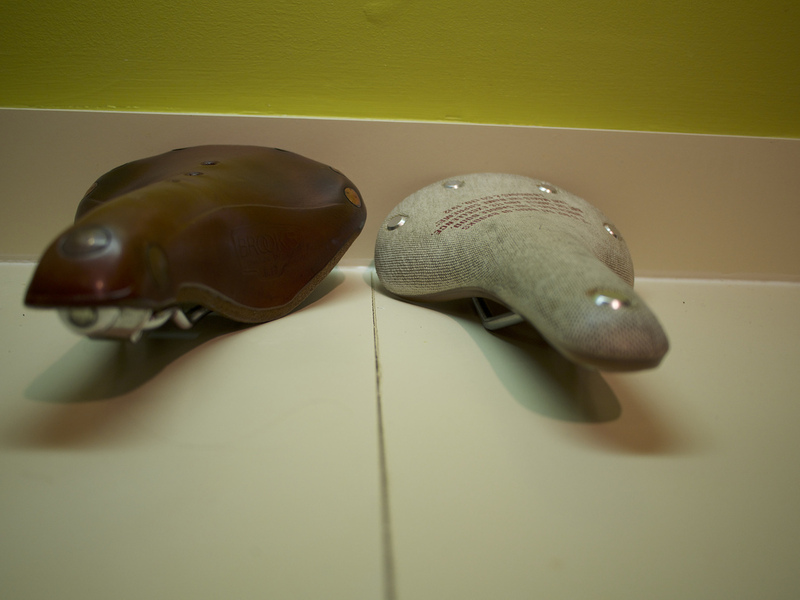 Brooks B17, left and Cambium C17 right. Side skirts are cut away, however, giving this saddle a racy look. Silver rivets, cut-away skirts, longer rails, rubber base. Comfort: The other similarity to a B17 is flexibility. With a firm downward push, the C17 flexes vertically the same way as a B17. Tooling around downtown urban streets, I found it felt like I was on a nicely broken-in leather Brooks. I think they worked hard to get this right because unlike leather you can’t turn an adjusting bolt to tighten the saddle tension. Big differences: Besides overall appearance, and the lack of side skirts, the biggest change for current B17 owners is that the saddle is not as tall and the rails are slightly longer and set farther forward. Different rails: B17 on left, C17 on right. That means you have to raise your seatpost about a half-inch, and can push the saddle back more than a B17. There is at least 5 mm more rail length, but Brooks appears to have positioned the usable rail length closer to the nose, which allows a little extra rearward positioning. Finally, the Cambium weighs in well under the B17. I did not weigh mine, but Brooks claims 415 grams for the men’s C17 and 405 grams for the shorter-nose, slightly-wider women’s C17 S. Those weights compare to the B17’s 540g listed weight. Purpose: Who is this saddle for? Do you wear form-fitting jersies from a certain apparel maker based in England and ride a spotless racing bike? On appearance alone, the Cambium line should fit your aesthetic. Brooks also makes the Cambium line in a dark slate gray that is more sober if you are into the bike-ninja look. More seriously, if you don’t use fenders and worry about a Brooks getting destroyed from wheel spray, there is no such concern with the Cambium. On any bike you can still ride in the rain or soak it in sweat without worrying about covering the top. If you have a hard time getting a B17 or other Brooks far enough back on a given bike, this saddle may also offer a solution. And, if you don’t want to break in a leather Brooks, the Cambium is ready to go out of the box. Fears about breaking-in can be overblown, however — Brooks are generally comfortable for us from the first ride and get nicer over time. We are more likely to encounter our Brooks saddles getting stretched out too much from hot summer rides, brevets and multi-day touring. The Cambium presumably won’t get scooped like our B17 models after a few seasons. Conclusion: Will I buy a Cambium C17? Probably. I’m put off by the $160 pricetag, but the value of a saddle with the same comfort as a B17, rear bag loops, longer rails and weatherproofing has its attractions. If Brooks runs a promotion that gets the price down I’ll probably take the leap. I like that they are trying to create a new saddle that expands the Brooks line and replicates the comfort of leather without some of the care considerations and weight. At last they tried to resolve the issues that come with the short-ish rails on the leather models. The C17 may find a home on my Ritchey Road Logic racing bike where saddle setback has always been an issue. See more photos of my test saddle at my Flickr page. Please leave comments on your experience if you have purchased a Cambium. I want to extend my thanks to BicycleSpace for loaning me the saddle to test. They have an extensive range of Brooks saddles and other fine urban riding gear and a solid service department. If you are in the D.C. area they are definitely worth a stop. Great review, Felkerino! Like you, I’ve had my eyes on these for a while. Unlike you, I don’t live near a great shop like BicycleSpace that provides an opportunity to sample a loaner. Like you, I’m less concerned about break-in time and more concerned about long-term wear of the leather saddles. I have two B-17 which are cracking a bit by the rivets, which may be the result of poor positioning on my part, but the Cambium may provide a good alternative. I also like that they’ve been able to trim the side skirts, which wear against my shorts over time on the B-17. I’m also curious to see their yet-to-be-released C-15, although your review makes the C-17 look plenty racy. Hey George — three-time coffeeneur, congratulations! I plan to get a C-17 at some point and put it on the tandem. If it wears better than the B-17 that would be a good place for it. And we all know that you have to test your PBP gear this year, right? Hi Felkerino… what a great review! I´m João and i´m from Lisbon, Portugal. If you don’t mind, can I ask you a couple questions? Although the review is very explanatory, I have a doubt: I like to make one or two trips a year, is Cambium a good and comfortable saddle for touring? It will be good to ride around 100/120 kms (62/75 mls) a day without being in pain or numb to the point of stopping? Sorry to be bugging you with these questions but as you’ve tried it you may be able to answer me. Thank you … and sorry for any mistakes in my english. Your English is good. I wish I could help. My rides were all relatively short, less than 20K. You’ll have to find someone in the randonneuring or touring community to find out about longer use. My big issue with the C17 would be the durability of cotton. I’m approaching this from the opposite end of the saddle spectrum – I ride a San Marco Regal because I just hate Brooks saddles (uncomfortable for me, a pain to maintain in our wet climate, having to tighten the saddle, etc.). But even the sides of a leather-covered Regal wear at the side skirts after a year or two of heavy use, so I don’t hold out much hope for the durability of cotton. I wonder why Brooks didn’t just create the C17 with a leather top over the plastic base? But I agree, the price is pretty steep for a saddle with questionable durability. You can usually find a Regal on sale for at or under $100. Great review Felkerino, we appreciate your insights! Hi! Your article about the C17 is really interesting. I had a short test with this saddle. In my opinion is a good saddle but i continue to prefer the leather Brooks. Bye from Italy! Awesome in depth hands-on review! I currently have the Brooks B17 leather saddle on my Brompton, but I think I am going to swap it out for the Brooks C17 non-leather saddle. Not a big fan of the leather, and it is not waterproof like the C17 is. I also like the fact that C17 weighs less and looks less bulkier and leaner than the B17. Like the rivets. They really make the saddle pop! I love my new C-17. It fit perfectly right out of the box. Great quality and no breakin required. I like the woven look–it matches the “weave” of the carbon fiber frame it sits on. On it’s first ride, after 10 miles I didn’t think about it anymore. In my mind, that’s the mark of a perfect saddle. Ordered a Cambium recently and have ridden about 250-300 miles on it. As much as I wanted the gorgeous and waterproof saddle to be the answer, it IS NOT as comfortable as the B17 and does not flex or adapt to your backside as the leather does. I have two B17s and I believe I will sadly sell the Cambium and get a custom designed waterproof cover for the B17s. They are HARD to beat. So how does the Cambium feel compared to the bounce of a Flyer? Same cush? I am thinking of getting a Cambium because of waterproofnesss, but was wondering if it kills roadshock as well as a Flyer. Oh, no. The Cambium is very firm, with a little flex, but nothing like the Flyer, which I have on an MTB bike and really like for that use. Nice review. I am torn between Brooks C15 vs B17 Narrow. Which is more advisable, between the 2? I am planning to use it in road cycling and I am not racing. Given that cost is not a concern. 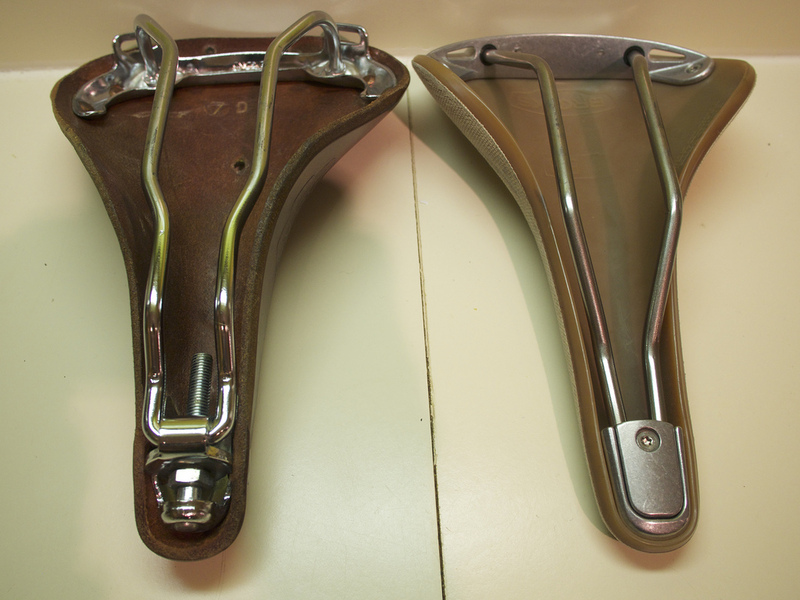 The C15 is intended to be similar to the narrow racing saddles on the market today. I have not used the B17 Narrow — just the standard, wider B17. The Cambium would be the better choice, I suppose, for a bike without fenders, it can take the rear wheel spray. Thanks for the tip :) I am looking forward on owning a brooks saddle. 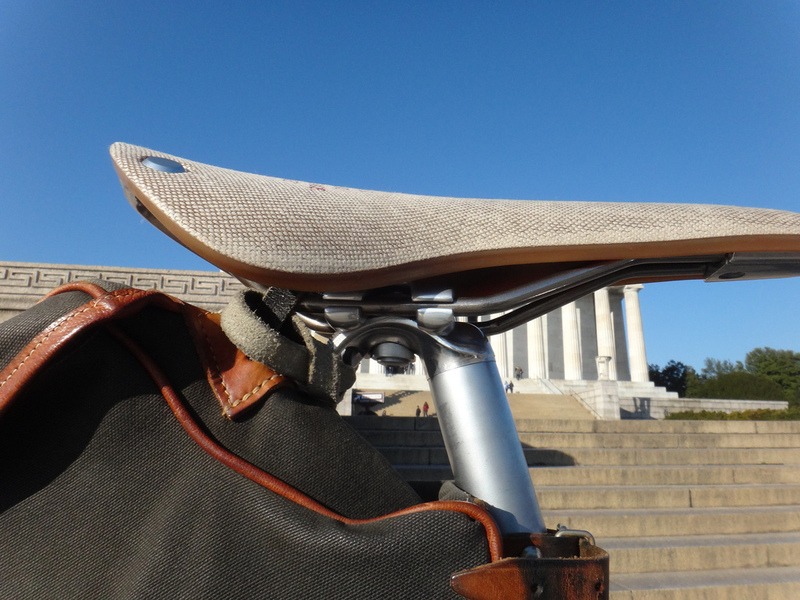 The B17 narrow is, I think, the firmest saddle in the range. I found it to be miserable. Just hated it. I sold it in E-Bay. I have about 3K miles on a traditional B17 and it is near-perfect comfort-wise. It is a little heavy but I have it on my beater commuter bike that weighs 40#. I had a Ti Swift on a custom stainless bike which felt just like the B17 – I was definitely going to like that one once it broke in. Then the bike was stolen. I had a C17 on another road bike and it seemed pretty good but the bike was stolen along with the other one. I have a C-17 on my Rivendell Romulus and it’s fantastic. I’ve only ridden about 1000 miles on it, so I can’r say much for durability yet, but it’s been comfortable the whole time, and it seems just as springy as it did out of the box. I’d put one on m,y beater, but in this town (Long Beach, CA) it would just get stolen (and I’d rather not yank my seatpost every stop at the grocery store. I’m moving to Oregon and building up a touring bike this fall, and while I love the B-17’s look, I’m considering another C-17 because of the rain.